Indoor and Swinging Coasters around the world: part two of the Vekoma retrospective. 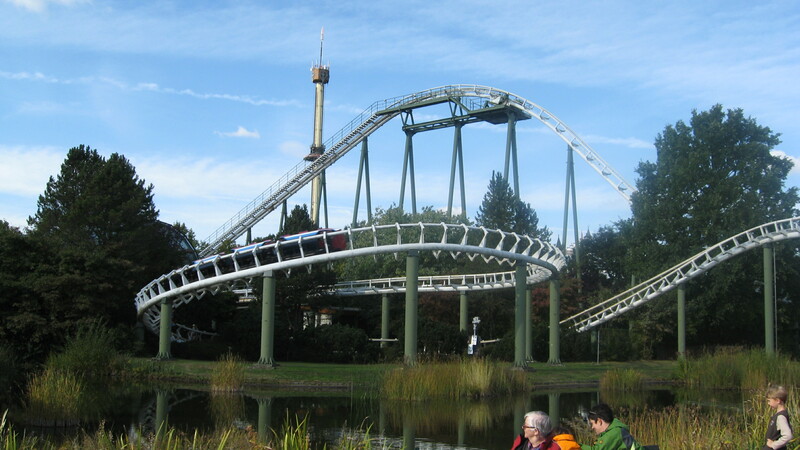 In 1983, Vekoma sold the Big Loop to Heide Park (Soltau, Germany). This was the first ride to feature 4 inversions in Germany and is a mirrored near clone of the Arrow 1981 Dragon Fire at Canada’s Wonderland (Vaughan, Ontario). The biggest difference is that while the Dragon Fire use the standard before station sliding Arrow transfer track, Big Loop instead has a rotating track section right after the post station dip. A brake is installed right after to stop the train. The track is switched over and then the train is winched back into the transfer track. It was also configured for two trains operation from the start. Dragon Fire was initially delivered with 3 trains, but it quickly dropped down to two, as the ride is too short and you’d have the third stopped on the mid course brake. Interestingly, the park kept that train and recycled it for the 1987 Bat, which is a Boomerang. 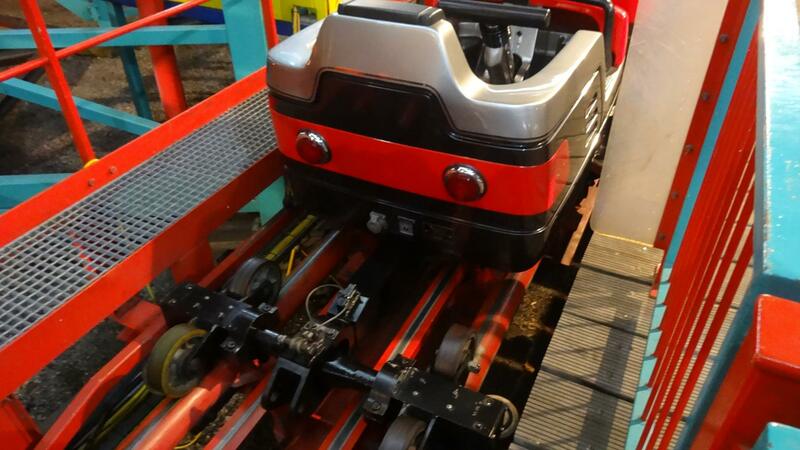 Vekoma refurbed the train and installed the proper hardware on it and it is in use since on the Bat. Big Loop layout at Heide Park. Back portion of the layout. In 1985, at the demand of Dostal, the owner of a concession at the Wiener Prater (Vienna, Austria), Vekoma brought back the classic Wild Mouse to Europe as the Speeedy Gonzalez. Invented in the 1950’s and originally constructed out of wood or flat iron, this roller coaster main feature was to have small individual cars going around tight flat curves and sharp steep drops, replicating what a mouse would do when trapped in a labyrinth. One unique feature is that the front of the car extended beyond the wheel base, giving the impression that you were derailing and “missing the curve” every time the vehicle zipped around a turn. In the early 1980’s, Meisho Amusements and Togo International from Japan restarted production of a new generation of Wild Mouse. Vekoma designed a very large layout with many drops and curves for Dostal and at the owner request; the lift hill track is actually tilted to the right, to go with a spinning tunnel that was installed at the time. After 3 seasons, the ride was sold to John Broome, owner and operator of Alton Towers (Alton, UK). The ride was renamed the Alton Mouse and placed in a new area called Talbot Street. The spinning feature was removed, but the tunnel remained in the place on the lift. 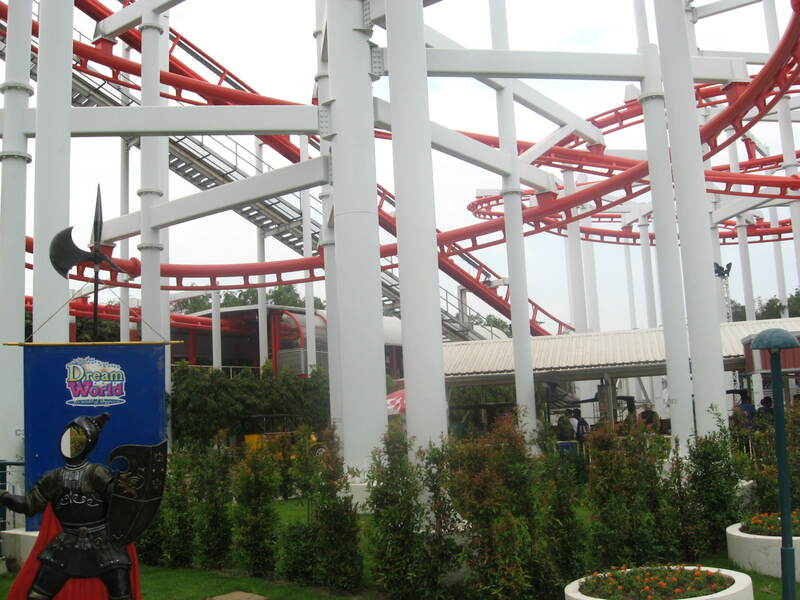 The ride used the standard Vekoma pneumatic brake calipers, but due to the car light weight and short brake fin, riders experienced rather a rather sudden stop at the end. That, the ride popularity (with 6 cars running, capacity is only 480pph and thus long lines in a small area) and the ride close location to the village that neighbors lead to the park closing the Talbot Street area in 1992. The ride was then sold to Kennywood (West Mifflin, PA) originally to be used as an indoor attraction called “The Exterminator”. The owners then re evaluated the ride and placed the ride in 1993 at Kennywood sister property, Idlewild and Soak Zone. This is a family park that had been owned by Kennywood since 1983 and it became the park second roller coaster. It was simply called the “Wild Mouse”. The Wild Mouse was a popular ride at the park, but it still suffered from the extremely harsh braking that had plagued it at its two previous parks. In 2002, the solution was found: at spots where speed adjustments has to be done to improve comfort and at the end, Magnetar Technologies was called to install eddy-current magnetic brakes. The brake fins were changed to the proper material and the ride is now a lot smoother and reliable. Maintenance costs were also greatly reduced. The ride was closed for the 2012 and half of the 2013 season, but it was fixed and reopened in July 2014. 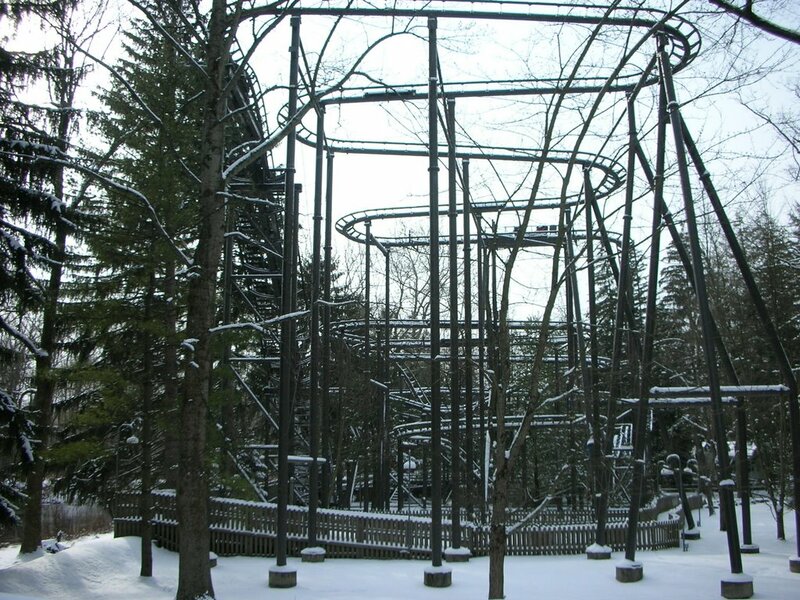 The large Wild Mouse under the snow during the winter of 2006. Photo is from Idlewild park. Vekoma had to do two unique jobs in 1985-1986. Two projects had been started by Arrow-Huss (a result of the merger of both companies in 1981) and in 1985, Arrow-Huss declared bankruptcy due to the company major investments in Darien Lake (Darien Center, NY) and New Orleans World Fair (held in New Orleans, LA) in 1984. Darien Lake was used as the North American showcase for the company, but that and the failed World Fair were a heavy drain on the company resources and it forced them to enter Chapter 11 in 1985. Two rides were already being constructed: The Scream Machine at Expo 86 (Vancouver, BC) and the Crazy Roller Coaster at Nanhu Amusement Park (Guangzhou, China). 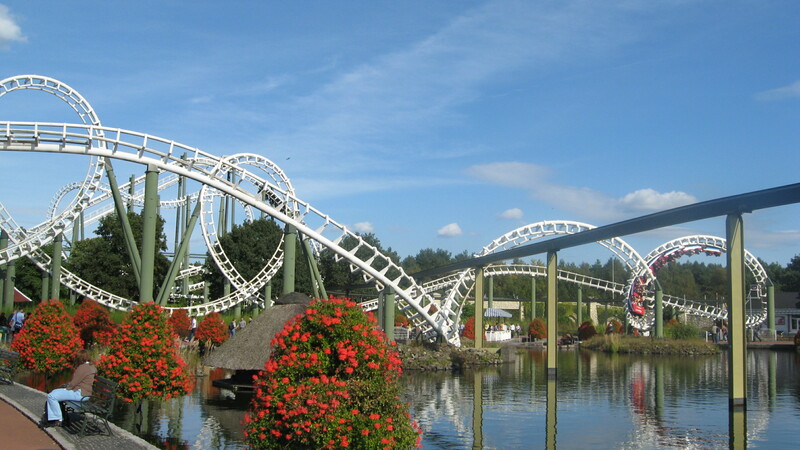 Since Vekoma had already been using most of the Arrow technology and their own track and component were compatible, Vekoma came in and finished both rides for an on time 1986 delivery and opening. Scream Machine operated for the duration of the fair and was then sold to Six Flags, who placed it at their Eureka, MS property, Six Flags over Mid America (now Six Flags St-Louis) where it opened as the Ninja in 1989. Crazy Roller Coaster closed in 2013. The top of the lift hill and the curve into the Corkscrew. The train exiting the mid course brake. The first Sidewinder inversion and the train going up the lift hill. Vekoma evolved the Whirlwind model in 1986. 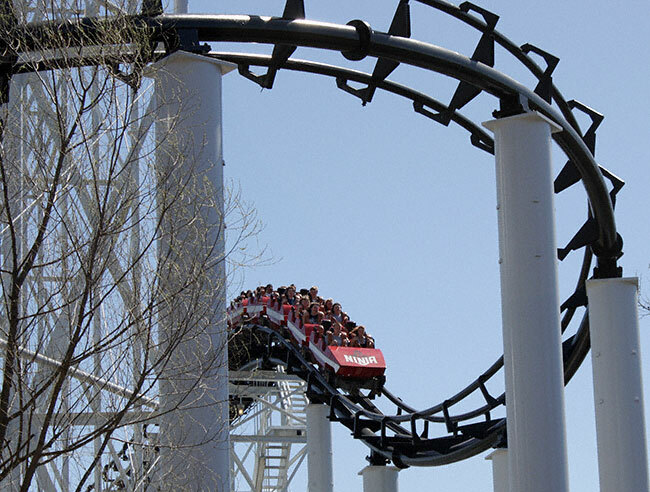 The first corkscrew was replaced by a loop and the ride went from a steel frame to a foundation/steel frame hybrid. 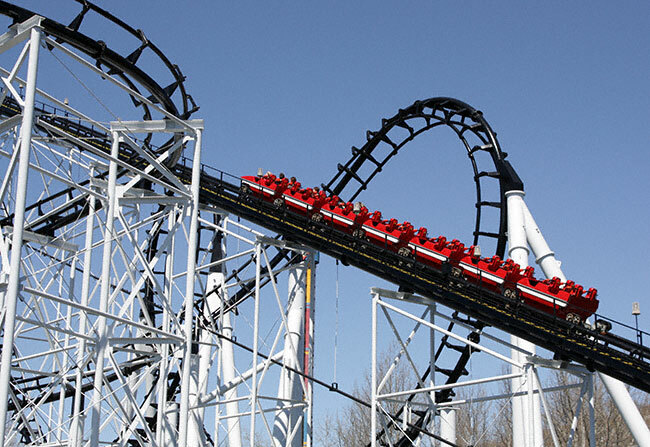 The loop is supported by foundations similar to the Boomerang loop and the rest has the Whirlwind frame. The original went to Tokyo Summerland (Tokyo, Japan). Two further models were produced in 1988 and 1990. Vekoma licensed a second track system from Arrow in 1986-1987. 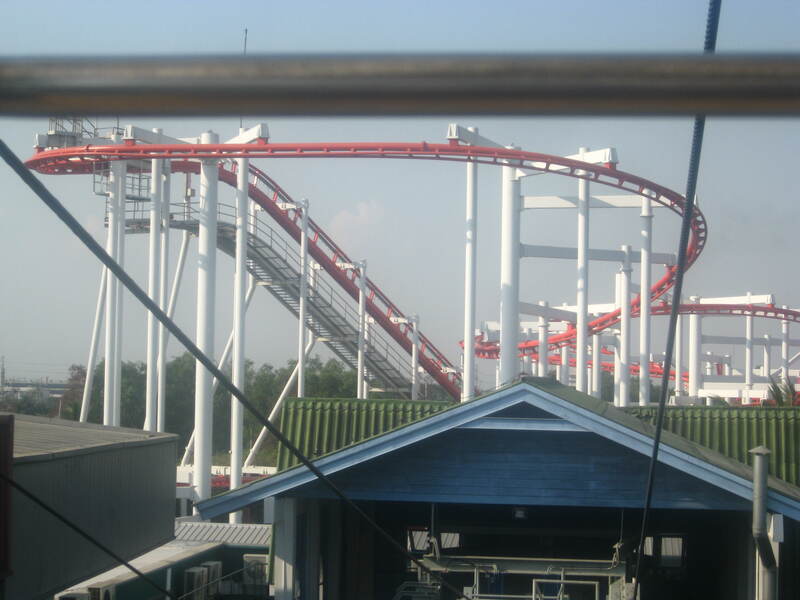 Arrow had successfully launched 2 Suspended Roller Coaster in 1984 and now Vekoma would design their own version. Unlike the Arrow designs, which were all space intensive large layouts with two lift hills, Vekoma went the opposite route with a smaller layout that fit in a small 289 feet x 125 feet space and only used one 82 feet tall lift hill. The 6 cars trains would then navigate a helix filled track that was 1963 feet long. One part of the agreement with Arrow was that Vekoma would need to use Arrow rolling stock, like with the looping track. So, for the first installation, Air Race at Bobbejaanland (Lichtaart, Belgium), Arrow designed a propeller airplane car body complete with small wings. Those were among the most beautiful cars ever designed for a roller coaster. In 1988, Vekoma sold another Swinging Turns (the name Vekoma gave to its suspended coaster) as part of a 3 coasters package to the 1988 World Fair in Brisbane, Australia. This installation featured standard Arrow trains and was named the Centrifuge. The last Swinging Turns went to Mitsui Greenland (Arao, Japan) and it opened around 1989-1990. Grampus Jet is its name and Arrow designed Orca cars for the ride. Part of the layout for the relocated Centrifuge, now at Dream World (Thanyaburi, Thailand) where it reopened in 1994 and is today named the Sky Coaster. Grampus Jet at Mitsui Greenland (Arao, Japan). 1987 saw Vekoma modernizing its designs with the introduction of AUTOCAD programs to aid in designing smoother and tighter layouts. This also allowed Vekoma to offer very fast design and construction, in order to have the shortest deadlines in the industry. The first rides to benefit from those were the new for 1988 Custom Designed Indoor Coasters and the 1989 Custom Looping Coasters. The Custom Designed Indoor Coasters is offered in two track gauges and does not include inversions. The smaller track gauge is MK-700 and is used for smaller layouts that require tighter turns. 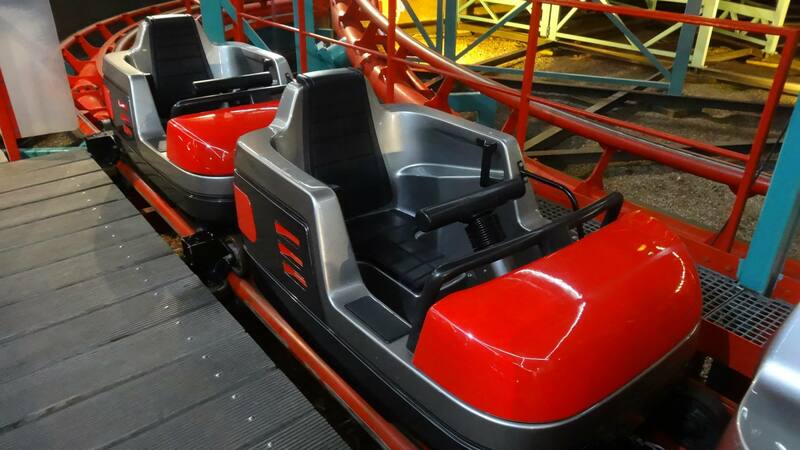 For the MK-700 (700mm space between rail which is 27.55 inches), Vekoma designed imaginative two seaters cars that are coupled together in a long train. Each car has one seat and one rider sit on the other rider’s lap, like on a log flume or bobsled coaster. To secure the riders, an extendable ratcheting T bar is installed in each car. 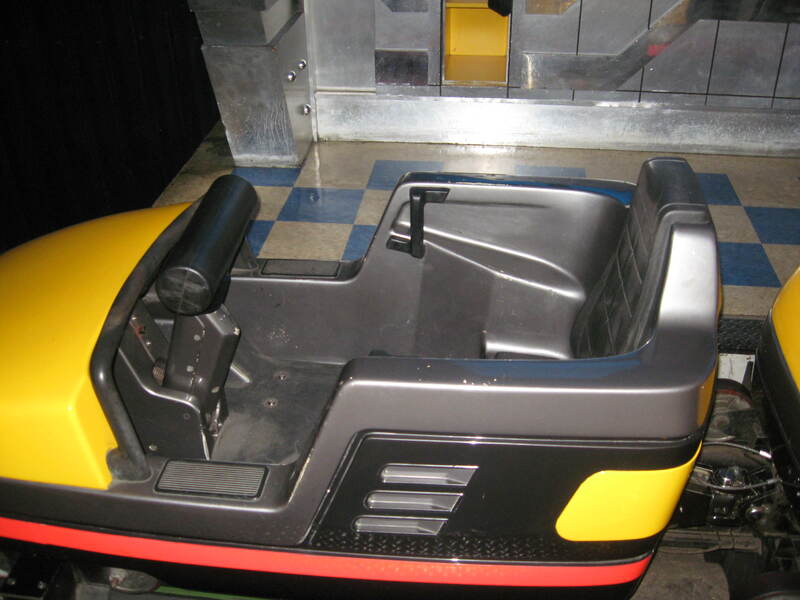 When there is a single rider, the lap bar is spring loaded and will extend out to the rider’s lap. The first roller coaster to use this innovative track and cars was the Nightmare at Boblo Island (Amherstberg, Ontario). It was an indoor ride that used a tire driven lift hill to reduce noise and a tight turn filled layout with no large drop and a small negative G hill toward the end of the ride. A curved station was also used to save space. Nightmare was sold to Six Flags after Boblo Island closed in 1993. 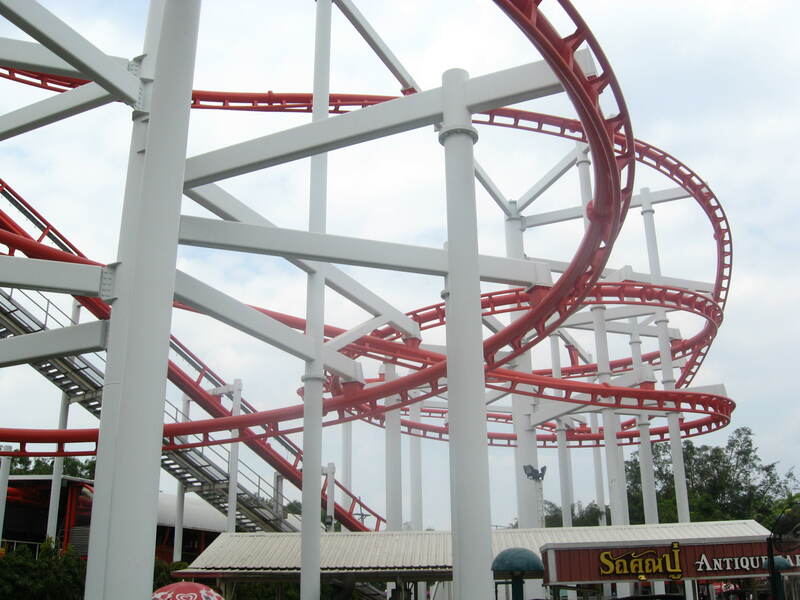 It became the Mayan Mindbender at Six Flags Astroworld (Houston, TX) in 1994 until 2005, when the park also closed and the ride was sold to its last home. 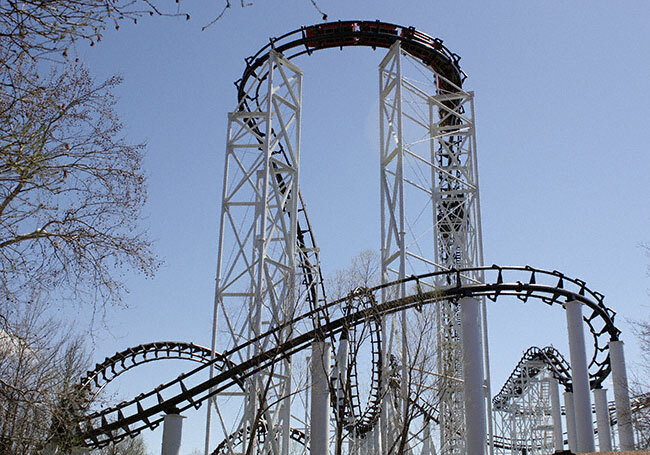 It reopened in 2009 as an outdoor coaster named the Hornet at Wonderland Amusement Park (Amarillo, TX). This is a MK-700 car used on Space Mountain at Formosan Aboriginal Culture Village near Yuchr Shiang, Taiwan. The ride is a custom 1992 installation set in the back of a building. MK-700 car used on the 1994 Megablitz at the Wiener Prater (Vienna, Austria). The second track gauge offered was the MK-900 (900 mm which is 35.43 inches). 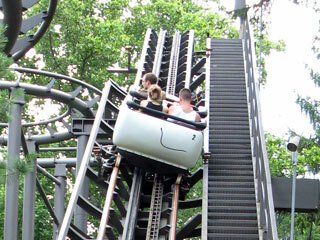 For this track system and the MK-700, Vekoma departed from the Arrow style track went to a large spine with V style crossties. The crossties were welded to the inside of the running rails, which meant that the car guide wheels were mounted on the outside, similar to how Schwarzkopf and then Intamin had their wheels arranged. 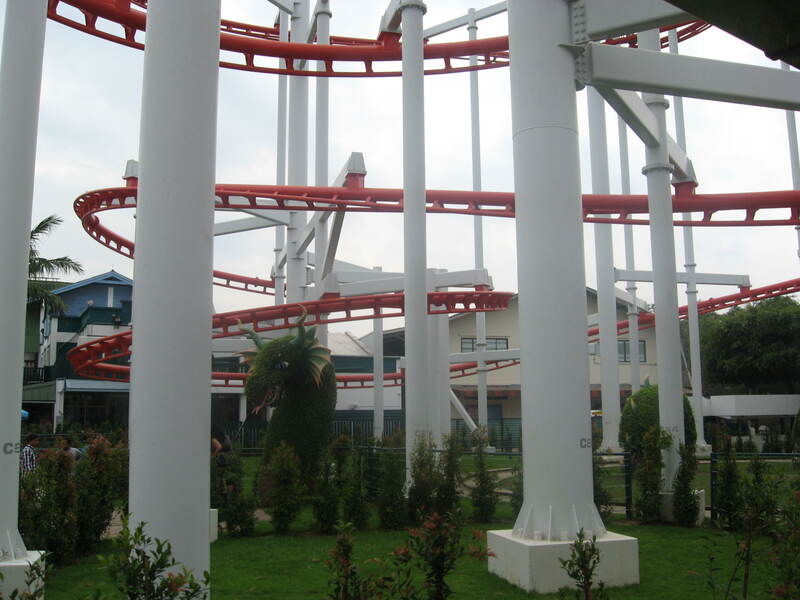 Due to the wider track, Vekoma designed new cars that were trailered to allow tighter turns. Each four passenger car has two molded individual seats per row and each rider is secured with a black ratcheting individual U shaped restraint. For 1988-1989, three rides were produced with this system: the Londonderry Express at Lotte World (Jamsil, South Korea), the Supernova at the 1988 World Expo Fair (Brisbane, Australia) and the record breaking Space Center at Phantasialand (Bruhl, Germany). Londonderry Express used MK-700 track and was an outdoor installation. It was meant to serve as the smaller family coaster for the new park. It closed in 2001 and reopened in 2009 at 99 Village in Al-Jahra, Kuweit. It was renamed Jabbar’s Rollin’ Adventure and the train original theming preserved. Supernova and Space Center were both housed in elaborate steel buildings that were designed by Vekoma at the same time as the layout. For Space Center, in addition to housing the world longest indoor coaster, the ride start at the 26 feet level of the building. The lower portion was left open by Vekoma for further use by the park. The coaster is 4265 feet long with three lift hills and it was capable of running 5 trains at once. The original theme was a trip through space and in 2002, the ride was renamed “Temple of the Night Hawk”. It was given a bird of prey makeover with laser projections inside and the soundtrack from the movie “Dinosaur” playing in the ride main area. Supernova was the last of the ride and it also had a space theme, with projections on the lift hill and various effects during the ride. 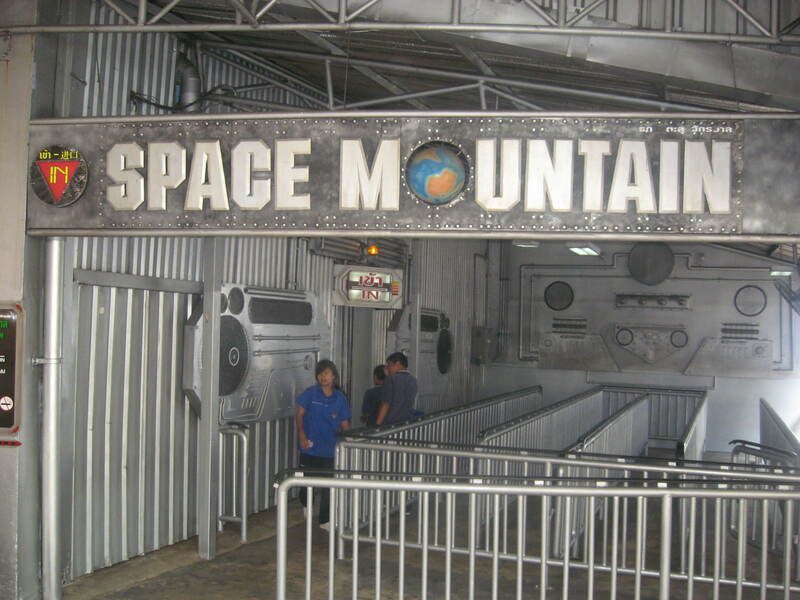 That ride operated with two 16 passengers trains and the roller coaster and building moved to Dream World (Thanyaburi, Thailand) where it was renamed as “Space Mountain”. Both “Space Mountain” and “Sky Coaster” (Australia Swinging Turns) opened with the park in 1994. Entrance of Space Mountain at Dream World. This entry was posted in Coasters, Industry Profile and tagged Coaster, Dream World, Formosan Aboriginal Cultural Village, Lotte World, Ninja, Phantasialand, roller coaster, Six Flags St-Louis, Space Mountain, Suspended Coaster, Vekoma. Bookmark the permalink.